Hey spouse, after you finish reading this, let's play a round of Portal. It's been a while. Anyway, getting back to the main point of this article, the sector of biotech I work in has nothing to do with agriculture, and biotech is a huge umbrella term for many, many sectors. In the different websites I write for, I've tried to be as transparent as possible and have made my LinkedIn profile public. Accusing me of being a shill for Ag is equivalent to accusing an organic apple farmer of being a shill for McDonald's because they're both in the food industry. The shill-gambit is used very often in topics surrounding biotech, such as vaccines or GMOs, and it's a shame because it doesn't really help support any argument. However, in reading many articles about GMOs, I'm always struck by the double-standard that exists when it comes to financial motivations. Why is Dr Mercola as popular as he is, when he sells supplements promoted in his articles? How isn't that a conflict of interest? Or take, for example, the Institute for Responsible Technology: its founder writes an article about gluten allergies and GMOs, with the only evidence being material from the website itself, and then encourages you to buy items that they recommend. It's a guarantee that I'm funded by GMO related corporations! The Non-GMO Project is another example, and I'm going to highlight this by following the story of Dr John Fagan, a molecular biologist who became part owner of a company named "Genetic ID" around 1998. Genetic ID is a company that does DNA testing to determine if foods contain GMOs. Genetic ID is also one of a handful of labs that is used by the Non-GMO Project for its certification process, and is a "Non-GMO Project Approved Lab". Therefore, the greater the customer demand for non-GMO certified products, the more money flows towards Genetic ID and towards its owners. The Non-GMO Project's website has a lot of information geared to highlight the value of a GMO-free diet. For example: "a growing body of evidence connects GMOs with health problems, environmental damage and violation of farmers’ and consumers’ rights", or "Most developed nations do not consider GMOs to be safe", or "The long-term impacts of GMOs are unknown, and once released into the environment these novel organisms cannot be recalled." There are no references or citations provided for any of these statements, so their validity cannot be assessed. If you visit the website's section on GMO Science, it points you to a document entitled "GMO Myths and Truths". The website explains this document by stating that it's "an evidence-based examination of the claims made for the safety and efficacy of genetically modified crops. This 2014 document is prepared by the preeminent researchers and scientists: Michael Antoniou, Claire Robinson, and John Fagan." I just want to pause here for dramatic effect, and to make it clear that the author of the scientific document that the Non-GMO Project provides is the same guy that owns one of the labs that the Non-GMO Project uses for its DNA verification process. apparently I'm funded by Monsanto. I reviewed the first chapter of GMO Myths and Truths a long time ago and the rest of the chapters I've slowly debunked, although not as directly. The document embodies "Gish Galloping" which basically consists of throwing so much information and so many references at a person that they could never debunk your argument. Instead of providing 1-2 references that encapsulate an argument, 50 references are provided most of which don't really support the argument being made. I've been sent the document several times in the course of my discussions on GMOs, particularly on Twitter. If you scan through "GMO Myths and Truths", you may be stunned by the seemingly overwhelming evidence against GMOs and you might freak out, and that's what the document is intended to accomplish. But if you peel back the document's polished, shiny exterior and look at it in depth, you'll see that most statements are hypotheticals of things that might happen. There's a difference between what's possible and what's probable. Is it possible that I might get struck by lightning while getting bitten by a hammer-head shark? Sure. Is it probable? Not really. So many, many statements made in GMO Myths and Truths are presented as possibilities, yet the probabilities are never addressed. And I'm sorry, but any document that supports Seralini's study loses all credibility. Anyway, John Fagan is one of the authors of this document. The elegance of it is quite admirable: scare the bejeezus out of people about what's in their food by producing a "scientific" document with all the right words and language, thereby increasing the demand for non-GMO verified products. In fact, John Fagan is the Executive Director for Earth Open Source who put together the "GMO Myths and Truths" document and several other similar publications. The organization's goal is to "restore the open source roots of the food system – collaboration, transparency, and shared knowledge and resources – to help feed humanity, increase equity, support self-reliance and foster healthy ecosystems." The success of an entity such as the Non-GMO Project relies on pressure from groups such as GMO-Free USA to persuade companies into believing that the Non-GMO Project label will be of value to their customers. With systematic and well-coordinated campaigns against companies, non-profit groups such as GMO-Free USA and GMO Inside have managed to convince companies to create GMO-free products: Similac recently announced that it was making GMO-free formula, General Mills decided to take the GMO-free plunge with Cheerios, and Hershey's has decided to go non-GMO. GMO-Free USA also shuns GMO-free labeling if the certification isn't through the non-GMO project. And guess who is on the board of advisors for GMO-Free USA? John Fagan. Nothing that John Fagan has done here is illegal. Nothing here is different from what many other companies out there are doing. I write this to highlight the double standard that exists when it comes to GMOs: if I had written this exact same story, replacing Dr Fagan with an executive at Monsanto, and if the organizations listed advocated for biotech, I'd like you to think of the outrage that would exist as a consequence. Well-designed studies that receive industry funding are discarded because of their "ties to ag", but a poorly designed study that receives funding from non-GMO organizations is ethical, and if flaws in the design are pointed out then it's considered to be a "smear campaign" orchestrated by shills. Last week, I got a comment asking me about the Environmental Working Group's (EWG) dirty dozen: every year the EWG puts together a list of fruits and veggies that have the highest amount of pesticide residue, and advises people to eat the organic version of these. The EWG's methods have been found to be flawed, and there's no evidence that eating the organic version of the fruits and veggies on their list is "healthier". Additionally, EWG receives funding from the who's who of organic companies including Organic Valley, Stonyfield Farms, Earthbound Farms, and Dr. Bronner Soaps. I consider this a double-whammy: 1) no science to back them up and 2) funding from groups that benefit from their scientifically-questionable publications. Again, replace the characters in this story with a company against whom you may have a bias. Let's use Coca-Cola as an example: let's imagine that Coca-Cola gives funding to a non-profit who puts together a glossy brochure comparing caffeine free products between different companies. There's no difference between Sprite and 7-Up, but they claim that caffeine free Coca-Cola has less caffeine than caffeine free Pepsi, and they recommend buying Coke. The difference is 2 parts per billion, but that's not in the glossy publication or in the press release. What would you think? Would your spidey senses start tingling? I assume that it would. So explain to me what the difference is between this hypothetical scenario and what the EWG actually does with their dirty dozen? The double standard here is mind-boggling. I'm going to quote from an article that I wrote a while back on a related topic: "The truth is that universities do not have a litmus test to measure your ethics. Companies do not have a sorting hat to determine if your moral standards are a proper fit. As such, there are unethical individuals in both areas. More importantly, there are many individuals with a clear sense of what is wrong and right. Science is science. Crummy science can be produced in publicly funded labs. Amazing studies can be published by individuals affiliated with an industry. There are many examples of both." Fair enough... But this person should also look at who sponsors Seralini. So whatever criteria you use to determine if someone is a shill should be applied across the board. Whatever criteria you use to determine if a study is scientifically sound should be used universally. Whatever standards you use to determine if an organization should be trusted should be applied to all groups, whether it's GMOanswers or Non-GMO Project. I can tell you that I've never received a penny for anything I've written related to GMOs, nor do I have a side business that benefits from what I write. I wonder if the authors of "GMO Myths and Truths" can say the same. A couple of weeks ago, a student from USF reached out to me for an interview for an assignment that she had. She had a series of questions about labeling, organic food, and GMOs. Once I had answered her questions, the spouse suggested that it would be good to share my responses on my blog (with a few edits), because it summarized my thoughts on quite a few topics. Q: Why do you think there is a debate about GMOs vs. Organic or natural produce? I think that it's because GMOs are feared as being “unnatural”. The idea of taking a protein from one species into another seems like something out of a science-fiction novel, particularly since the general population associates bacteria and viruses with harm and danger. So taking a gene from a bacteria and adding it to a plant has an "ick-factor" or a certain amount of "unnaturalness" associated with it. This fear has been harnessed by activists into campaigns against GMOs. Some of these groups are organic food proponents, such as the Organic Consumers Association or Only Organic, creating a false dichotomy of GMO vs organic. However, many farmers grow both conventional and organic crops. The dichotomy does not need to exist, and in fact, some GMOs could be grown using organic food production practices if the label allowed it. Q: Do you have a stance on the GMO vs. organic issue? How did it develop? My stance on GMOs vs organic has evolved quite a bit. 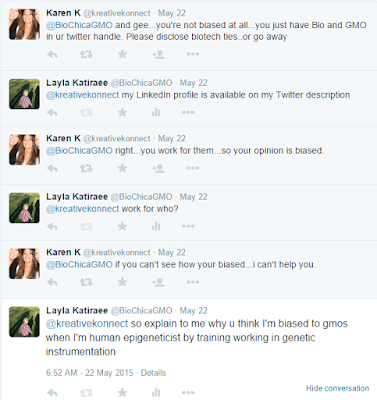 I never really had an issue with GMOs and I started blogging to learn more about them. So to be more accurate, my stance was with respect to conventional food vs organic food. The reason why I never had an issue with GMOs is because I don't view a protein or gene as "belonging" to a species. Genes get copied, erased, and shifted around all the time throughout the evolution of a species (actually, here’s a picture about one of my publications in grad school that outlines that the gene I was working on was copied in placental mammals, but not in marsupials). So I actually view the process of transgenesis (which is generally used to make GMOs) as more accurate, because you can select exactly what gene you want to copy or erase rather than letting it happen randomly (which is what happens when we crossbreed). When I started reading the scientific literature on GMOs, my mind was completely put at ease about the GMOs in our food supply, so I eat GMOs and feed them to my family. Regarding organics, when my son was born, my primary concern was the level of pesticide in our food. I began feeding him organic veggies, because I thought that they were pesticide-free. As I learned about our food and found out that organic food production does use pesticides, I was really taken aback. I read the recommendations from the FDA and USDA, and learned that washing fruits/veggies with cold water gets rid of pesticides, regardless of the method used to grow the crop. When I saw the actions of groups such as the Organic Consumers Association and the misinformation they spread about GMOs, I boycotted organic food entirely. Now, I've come to realize that all forms of food production have pros and cons. Farmers should be free to grow their crops with whatever method they find suitable, following laws and guidelines set forth by regulatory bodies. This creates a wealth of different foods grown using different styles. I try to buy what's in season from California (since it’s where I live), and I try to buy at the best price point, regardless of whether the food is grown organically or conventionally. At the moment, most of our fresh produce is conventionally grown. All the meat and dairy we buy is conventional. Some of our dry goods, particularly my son’s snacks, are organic (Costco has amazing deals on organic snacks for kids). Q: In your opinion should GMOs be labeled? Risk perception: A label stating "May contain GMOs" conveys the idea that GMOs may be harmful, which is why food manufacturers fight the label. Cost to suppliers/farmers: if we're going to start separating GM food from non-GM food, we’d have to start separating them from the source, and most of that burden will fall on farmers. They will have to have separate equipment, separate storage, separate transportation, etc for GM and non-GM crops, which will significantly increase the cost to farmers and the cost will probably trickle down to consumers. The cost of changing the label itself is not significant, but the cost of segregating crops will be burdensome. Defining what needs to be labeled: There’s no consensus on the definition of a GMO ingredient (here’s a recent post that I wrote on the topic). There are so many different criteria and examples: do we label the meat from a cow fed GM grain? What if the cow received a GM vaccine? Do we label sugar derived from a GM-beet, even though it contains no DNA or protein and is therefore indistinguishable from sugar derived from a non-GM beet? How much of a GMO needs to be present for an item to merit being labeled? There’s absolutely no consensus on what should be labeled. Labels already exist: if individuals are genuinely concerned about GMOs, then they should just buy food under the USDA’s organic label, which already excludes GMOs, ingredients derived from GMOs, and animals raised on GM-grains. Why do we need to go through the expensive legislative and burocratic process of creating a label for individuals who want to avoid GMOs, when there’s already a label in place to meet their needs? Arbitrary nature of the label: the demand to label GMOs is basically a demand to label how a crop was made. It doesn’t provide information on the amount of pesticide used, on the conditions the crop was grown in, or anything that might genuinely be informative. So why is there a demand to label transgenic crops, but not any other methods to develop crops, such as mutagenic crops (derived by radioactivity or mutating chemicals)? Crops derived through mutagenesis are accepted under the USDA’s organic label, so you couldn’t avoid them even if you wanted to. It doesn’t make much sense and seems completely random. Q: What is the number one misconception you hear repeated over and over again about GMOs? “GMOs aren’t tested. We’re the guinea pigs”. There’s a very large number of publications on the GMOs in our food supply and they range from animal feeding studies to environmental impact studies to tests/assays on identifying GMOs in our food supply. 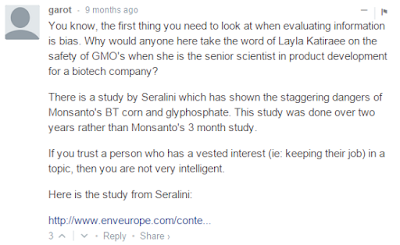 I understand the hesitation to trust data generated from the companies that develop GMOs, but many of these studies are carried out by independent researchers. You can find many of these studies in GENERA. Q: Are GMOs harmful or helpful to our world’s food economy? “GMO” is a (non-scientific) term used to denote that a crop is made through transgenesis. But the gene/protein/trait introduced into the crop varies. So GMOs should not be lumped all together into a single category: their value, pros, and cons depend on the trait that was introduced. For example, the Rainbow Papaya is a transgenic crop made to resist the papaya ringspot virus and revitalized Hawaii’s papaya industry. It has made a significant impact to the State’s economy and to its farmers. It’s a great example of how a transgenic crop can benefit a region’s economy. Q: What inspired you to begin writing about GMOs? When California had its labeling bill on the ballot, I started seeing a lot of contradictory information in the media on GMOs, particularly in social media. I thought that the responsible thing to do would be to go and read the original research papers myself and find out the truth of the matter rather than rely on someone else to tell me what’s true. Soon after, my husband and I had the opportunity to travel to Cambodia, and I learned a lot about their struggles to rebuild and how they were working with the International Rice Research Institute to try to increase their yields. I wanted to learn about how it was done, and it was what I needed to buckle down and start reading. I started writing just to document my journey and to share it with family and friends, so it’s been a surprising turn of events that has led me down a path where I find myself writing for larger audiences. Q: Where do you see the GMO labeling debate heading in the future? Do you think there will ever be an end to it? I think that the solution might be a Federal law on voluntary labeling, and I believe that most agricultural biotech companies as well as food companies would support such a law (one has actually been proposed. Read more about it here). However, that won’t stop the campaign of misinformation about GMOs. I genuinely do not know what the solution is to the latter and doubt that there will ever be an end to it. After all, there are still people who believe that vaccines cause autism and there are still groups that promote such ideas, despite the overwhelming amount of information and data to the contrary, so I don't think there will ever be an end to it in that sense. In the past, I’ve written a short list of problems that are attributed to GMOs, but are actually problems with modern agriculture. Well, I’m going to expand the list to “9 Reasons Why GMOs are Opposed that Aren’t Really About GMOs”, or as the spouse aptly entitled this post "I got 99 Problems, but a GMO Ain't One". But it's really only 9 problems. As I've written before, transgenesis, or the method used to make most GMOs, is a tool and it makes no sense to oppose a method with broad applications. It's like opposing electronics as a category because you don't like the fact that your Roomba chews up your computer cable (which is happening this very instant...) or that iPhones cost too much. In fact, an article was just written in the NY Times about GMOs, and in the comments section, you'll see the reasons below being listed time and time again. 9) "GMOs are patented". Yes, many of them are patented, but so are many non-GMO crops. Pluots didn't just drop out of the sky: someone had to work for years to develop those tasty treats, so there are patented varieties. Not all GMOs are patented: there are open-source GMOs, and there are also GMOs where organizations have worked with private enterprises to give away seeds on humanitarian grounds, such as Golden Rice. So using the "GMOs are patented" excuse makes no more sense than saying that you don't like electronics because Windows is under a copyright. 8) "GMOs cause superweeds". GMOs that carry traits for herbicide tolerance can lead to weeds that develop tolerance to the herbicide, known as "superweeds", and I've reviewed this topic here. Superweeds are far from being an issue unique to GMOs, and even pulling weeds by hand can lead to weeds that look like the crop itself (known as mimicry). The issue of superweeds is a serious one, and this database tracks herbicide resistant weeds as they develop across different nations. Reducing it to a "GMO-specific" problem and severely narrowing the scope of the issue, deters the efforts of finding genuine solutions to the problem. So using the "GMOs cause superweeds" excuse makes no more sense than saying that you don't like computers because they can lead to electric shocks, when the issue is much broader in scope. 7) "GMOs are drenched in pesticides". Yes, pesticides (be they herbicides, insecticides, or fungicides) are used on GMOs, as well as any other form of modern agriculture unless it specifically states "pesticide-free". That includes the U-Pick farm I went to last week for cherry picking and the organic peach farm next to it. That includes the fields of corn that we drove by to get there. It took me a while to come to the realization that no form of agriculture is perfect. If we insist on going pesticide-free, crops will be lost which will increase costs to consumers and we will have to dedicate more land to get the same output. Pesticides are expensive. Farmers don't just decide to spray their fields with pesticide because they feel like it, nor do they "drench" their fields in it. There are laws and regulations on how much can be applied, and why on earth would anyone use any more than necessary when its use can cut from your profits? Here's an excellent post written from a farmer's perspective on the topic of pesticides and why they're used. PLEASE read it. Some GMOs are designed to resist pests so that pesticide doesn't have to be applied, such as the Rainbow Papaya which is designed to resist the ring-spot virus and saved Hawaii's papaya industry. 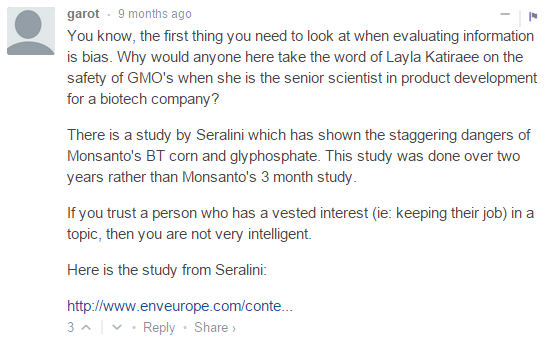 6) "GMOs are monocultures". When I was preggers, the spouse and I went on a road trip around California. I was miserable. I was one of those people who had morning sickness well into the 3rd trimester. Anyway, I was on medication to control it because I was losing weight, but the medication made me horribly drowsy. So the road trip ended up being more of a sleeping trip. Somewhere between Sequoia National Park and Fresno we drove through orange farms. And we drove. And drove. And drove. I don't know how long it was but it felt like every time I woke up, we were still driving by orange trees. And GMO oranges don't exist on the market. So yes, there are vast fields of GMO corn in places across the US, but there are also vast fields of non-GMO spinach and giant orchards of fruit. When I lived in Venezuela, we lived across from a valley that was a giant sugarcane farm. It was enormous and it belonged to the local sugar refinery. Every year, they'd harvest sugarcane about 3 times. It never changed, there was no crop rotation, and it just went on for miles. There's no GMO sugarcane. Monocultures can lead to crop resistant pests, and farmers are encouraged to rotate their crops from one year to the next so that this risk can be minimized. So, again, reducing the issue of monocultures to a GMO-specific one is highly disingenuous. 5) "GMOs are being made by Big Ag to line their pockets". Unless your problem is with making money in general, then this doesn't make much sense. Of course ag-businesses want to make money. Why would any corporate enterprise embark on a project where they think they'd lose money? Again, the "Big Ag" argument doesn't apply to all GMOs. Arctic Apples were developed by a small company up in BC, Canada that only had 7 employees. AquaBounty, which developed the transgenic salmon (not yet commercialized) only had 12 employees on staff in 2012. And of course, many transgenic crops are being developed by public sector scientists, some of which address undernurishment such as biofortified bananas to address vitamin A deficiency. This reason for opposing GMOs is like saying that you oppose electronics because Apple makes too much money from the iPhone. 4) "GMOs place restrictions on seed saving". This is tied to #10 on this list. Farmers who plant GMOs sign a contract where they state that they will not reuse seeds. In the same way that you're not supposed to copy and give away that Maroon 5 song that you just downloaded from iTunes because it's a copyright violation, farmers are supposed to respect the intellectual property rights of the companies with whom they have signed a contract. Many farmers have written about the plethora of choices they have when it comes to seeds (here's one of my favorite articles). Basically, if farmers do not like the restricted seed use, they don't have to buy the seeds. It's as simple as that. The fact that they do and that they buy the seeds on a fairly regular basis suggests that there's something about GMO seeds that they prefer. Not only that, but there are non-GE crops where farmers have to sign agreements as well (this includes non-GE sunflowers, which Chipotle switched to when they adopted more integritiness). So this has little to do with GMOs: it has to do with patents. If you can think of a better way that companies can recover the dollars they spend on making a product after the first year, by all means, make the suggestion. Farmers who do not use GMOs generally buy their seeds from one year to the next, too, because the seeds they plant are often hybrids. Recalling Mendel's pea experiments, this would mean that if farmers reused the seeds, only a portion of the following year's crop would have the traits they want. 3) "GMOs use the carcinogenic Glyphosate". Glyphosate use is not restricted to GMOs. That by itself is enough to earn it a place on my list. In fact, we just used it this week to get rid of a particularly thorny wild blackberry that we couldn't control and was right in Baby Boy's biking path along the driveway. Regarding the label "carcinogenic", I think that Dr Andrew Kniss wrote one of the most balanced pieces I've read on this topic, and I'd like you all to head over there to take a look. An important point to keep in mind is the time at which herbicides such as glyphosate are applied. Think about it: glyphosate is being applied so that corn/soy can grow heartily without getting choked out by weeds. Does it make sense to apply glyphosate when corn is several feet tall? Here's Pioneer's recommendations for glyphosate application, and they recommend using glyphosate when the plants are just a few weeks old. Between that time and harvest, it might rain, the sun will have beaten down on the crops, and the crops will have been watered. So saying that the corn we eat is "drenched" in glyphosate doesn't make sense to me. Regarding the amount of glyphosate used, I love this graphic by Sarah Schultz where she explains that approximately one soda can-sized amount of glyphosate is applied across an entire acre of crop in one season. More importantly, there are MANY GMOs that are not glyphosate resistant: the Arctic Apple or Innate Potato, for example, could be grown using organic practices (without the organic label), and again, all those GMOs that are being made for humanitarian purposes that have absolutely nothing to do with pesticides. 2-1) "Monsanto". I give Monsanto 2 spots on this list, because there are different aspects to the "I hate GMOs because of Monsanto" reason. 2) "GMOs promote a monopoly." Every time I see this, I think that someone over at Dow Agro is cackling. I work in a field in biotech right now where a single company has between 70-80% of the market. Google web searches are used almost 70% of the time. Android has 80% of the market in operating systems for smartphones. But strangely enough, I've never seen a "March against Google". I tried to find out how much of the seed market Monsanto owns, and the numbers are all over the place, because it's such an easy number to rig to portray your point. For example, Monsanto says that it has 5% of the world market in seeds. The Organic Consumers Association says that Monsanto has 80% of the US GM market on corn. However, GMOanswers.com explains the latter by stating that they license the trait to other independent companies, so they're not sold by Monsanto. Commercial licensing agreements are set up between companies ALL the time, so the stat from OCA is blurring the real numbers. This would be equivalent to saying that the Lenovo laptop I'm typing on was sold by Microsoft because it has a Windows OS on it. No: the laptop and the sales go to Lenovo, which then pays Microsoft a licensing fee. So I honestly don't know how much of the seed market Monsanto owns. Keep in mind that organic and non-GM farmers have to buy seeds from somewhere, and Monsanto does sell organic seeds. Unless you know what seeds your local farmers used when you buy your veggies, you have no guarantee that you're boycotting Monsanto if you boycott GMOs. The problem with monopolies is a tough one and I don't know what the solution might be. Since it takes such a long time to get a GE product through the regulatory process, it's difficult for a small company to last very long. During that time employees need to be paid, logistics need to be taken care of, and the product pipeline needs to continue its development while no revenue is being generated. By no means is this a problem unique to the agricultural biotech sector. Small tech companies are gobbled up by larger behemoths every day. So the issue of monopolies is far from being a problem about GMOs. 1) "Monsanto made (place your favorite scary chemical here)". This is a topic that I'm struggling with myself. I know that Monsanto has a very checkered past, particularly when it comes to Agent Orange. Very briefly, Agent Orange is an herbicide that was used by the US during the Vietnam War to deprive the guerrillas on the ground of food and cover. Agent Orange production during the Vietnam War contained a contaminant which caused severe health problems in the local inhabitants. The US government placed orders from many companies for Agent Orange, and Monsanto was one of them. I don't know how it came to be that Monsanto is exclusively blamed for Agent Orange. As I see it, there are multiple people to blame, primarily the US government. I'm assuming that all the companies involved could have turned down the US government contract, and I'd like to believe that in an ethical world, they would have. But to blame Monsanto for this issue makes no more sense than to blame Boeing for military airstrikes, and I have yet to see a "March against Boeing". The Monsanto that exists today has gotten rid of its chemical division, however there's no denying that the company is built upon the revenue generated by the company that existed back when it made chemicals. There are many companies that exist today that were built decades or centuries ago under very shady circumstances (see the Hugo Boss brand as an example, where they provided uniforms during Hitler's Germany; here's a short list of companies that benefited from slavery. When the spouse read this section, his degree in Political Science kicked in and he started rattling off companies that benefited from times of war, including IBM). I believe that these companies should acknowledge their past and make amends. GMOanswers addresses the topic of Agent Orange and Monsanto, but they have a very PC statement basically pointing the finger elsewhere. Ultimately, this issue has very little to do with GMOs, but is a discussion that we need to have in our society. In conclusion: there are many legitimate concerns about modern food production. There are many legitimate concerns about the corporate nature of our society and the undue strength they exert over the American political system. These are the things we should be opposing. But whether you realize it or not, when you yell "No GMO!" and list one of the reasons above, the crops that are designed for you and I as consumers, the crops that are designed for humanitarian efforts, all suffer as a consequence. I know it doesn't make for a catchy slogan, but why not try voice your concerns by stating "No to the patenting of all seeds, regardless of technology used for their development!!" or "Increase funding so that our public institutions have the resources to commercialize and license crops!!". I'd recommend focusing your efforts on the REAL reason why you oppose GMOs, and not on the technology as a whole.